Peripheral biomarkers that identify individuals at risk of developing Alzheimer’s disease (AD) or predicting high amyloid beta (Aβ) brain burden would be highly valuable. To facilitate clinical trials of disease-modifying therapies, plasma concentrations of Aβ species are good candidates for peripheral AD biomarkers, but studies to date have generated conflicting results. Brain and plasma Aβ levels are partially correlated in SCD subjects. Plasma Aβ measurements are independent of APOE genotype. The model including only plasma TP42/40 level as a variable achieved the highest sensitivity in predicting Aβ PET positivity (83%). A simple preselection step using the TP42/40 classifier with an empirical cut-off value of 0.08 would reduce the number of individuals subjected to Aβ FBB-PET by 52.8%. Alzheimer’s disease (AD), the most common cause of dementia, is a neurodegenerative disorder characterized by progressive memory loss and cognitive decline . Pathological findings of AD include deposits of amyloid beta (Aβ) peptides in the brain conforming extracellular amyloid plaques together with intracellular deposits of hyperphosphorylated tau . The progressive increase of both pathological hallmarks is associated with gradual synaptic and neuronal loss resulting in the clinical deterioration of patients . There are no effective disease-modifying therapies for AD available at the current time. Neuropsychological assessment , cerebrospinal fluid  (CSF) analysis, and amyloid positron emission tomography (PET) scans are common methods used for prodromal AD detection. CSF and amyloid PET provide the most reliable in-vivo biomarkers of prodromal AD, but they are not suitable for population screening purposes due to the invasive CSF sampling procedure and the high cost and limited availability of amyloid PET imaging [6, 7]. Magnetic resonance imaging (MRI)-based AD biomarkers have demonstrated high sensitivity to prodromal AD ; however, the specificity of MRI is limited for predicting conversion of mild cognitive impairment (MCI) to dementia  and MRI is also impractical in patients with some types of pacemakers, metal implants, or claustrophobia. Consequently, despite the robustness of these biomarkers, they are not suitable for broad population screening in primary care clinical settings. Therefore, there is a growing need for accurate identification of asymptomatic (preclinical) individuals with underlying AD pathology to improve diagnosis and subject inclusion in prevention trials of prodromal and presymptomatic AD. Discovery of blood-based AD biomarkers would entail important cost-benefit and scalability advantages over current techniques, potentially enabling broader clinical access and efficient population screening. The plasma concentration of Aβ is a logical candidate, but studies to date have produced conflicting results on its utility . Several longitudinal studies with large cohorts such as the Framingham Study  with 2189 dementia-free participants followed from baseline until they developed dementia, died, or had been followed for 10 years and the Rotterdam Study  with 1756 participants and 392 incident dementia cases identified (follow-up mean 8.6 years) have reported increased risk of dementia associated with lower Aβ42/40 plasma ratios and that a reduction in plasma Aβ42 levels over time is linked with cognitive decline [13, 14]. A recent publication  studied the ability of Aβ precursor protein (APP/Aβ42), Aβ40/Aβ42 ratios, and their composites to predict individual brain Aβ+/− status determined by Aβ-PET imaging. The results showed that all test biomarkers correlated with both Aβ PET burden and levels of Aβ42 in CSF in two independent cohorts, demonstrating that the three different types of Aβ-related biomarkers (plasma, CSF, and PET imaging) are highly correlated with each other, clearly indicating the potential utility of plasma biomarkers. Furthermore, an independent study  suggests that individuals with subjective cognitive decline (SCD) exhibit significantly higher Aβ42 plasma concentrations compared with participants with no complaints. However, other studies have reported a weak or even a lack of association of plasma Aβ42/40 ratio with AD diagnosis [17–19]. Given that both subjective complaints and impaired episodic memory are present in MCI, the existence of an earlier distinct clinical stage where subjective complaints exist in the absence of detectable objective cognitive deficits is plausible . There is evidence suggesting that SCD may increase the risk of progression to cognitive impairment and dementia , and that individuals with SCD have a higher risk of developing AD , and present more functional deficits  and AD brain pathology than non-SCD participants . SCD might represent the earliest point on the continuum of clinical Alzheimer’s symptomatology [25–27], even anticipating the onset of subtle but detectable neuropsychological or biological alterations. Hence, a better understanding of the baseline characteristics of this group of patients may enhance our knowledge of early AD processes, facilitating early diagnosis, follow-up, and preventive treatment, making SCD an interesting target population to study. The primary aim of this study was to assess the association between plasma Aβ levels and amyloid brain burden. Specifically, we measured Aβ42 and Aβ40 plasma levels using two specific sandwich enzyme-linked immunosorbent assay (ELISA) kits, ABtest40 and ABtest42 (Araclon Biotech, Zaragoza, Spain), and quantified amyloid brain burden using florbetaben(18F) (FBB)-PET global standardized uptake value ratio (SUVR) in 200 individuals with SCD. We evaluated whether plasma Aβ ratios may be useful biomarkers for AD and a screening tool for amyloidosis in healthy populations. The Fundació ACE Healthy Brain Initiative (FACEHBI) uses a convenience sample of 200 individuals (mean age 65.8 ± 7.2 years; 37.5% males) diagnosed with SCD at Fundació ACE (Barcelona, Spain) recruited from Open House initiatives . The cohort comprised of 52 (26%) APOE ε4 allele carriers and 18 (9%) individuals with a positive (SUVR > 1.45) FBB-PET scan. The demographic characteristics of the study cohort are summarized in Table 1 and Additional file 1 (Table S1) by FBB-PET status. The SCD criteria used to recruit subjects in this study have been described previously . Briefly, inclusion criteria were: 1) subjective cognitive complaints defined as a score of ≥ 8 on MFE-30, the Spanish version of the Memory Failures in Everyday Life Questionnaire ; 2) Mini-Mental State Examination (MMSE) score ≥ 27; 3) Clinical Dementia Rating (CDR) = 0; and 4) performance on the Fundació ACE Neuropsychological Battery (NBACE)  within the normal range for age and educational level. Exclusion criteria were as follows: 1) relevant symptoms of anxiety or depression defined as a score of ≥ 11 on the Hospital Anxiety and Depression Scale (HADS) ; 2) presence of other psychiatric diagnosis; 3) history of alcoholism and epilepsy; and 4) known renal or liver failure. Cognitive assessment was performed according to the routines of the Memory Clinic of Fundació ACE as described elsewhere . Baseline MRI of these subjects demonstrated the absence of signs indicative of brain pathology. All participants gave written consent and the protocol was approved by the ethics committee of the Hospital Clinic i Provincial (Barcelona, Spain) (EudraCT: 2014–000798-38). All MRI scans were acquired prior to FBB-PET. MRI were performed on a 1.5-T Siemens Magneton Aera (Erlangen, Germany) using a 32-channel head coil. Anatomical T1-weighted images were acquired using a rapid acquisition gradient-echo three-dimensional (3D) magnetization-prepared rapid gradient-echo (MPRAGE) sequence with the following parameters: repetition time (TR) 2.200 ms, echo time (TE) 2.66 ms, inversion time (TI) 900 ms, slip angle 8°, field of view (FOV) 250 mm, slice thickness 1 mm, and isotropic voxel size 1 × 1 × 1 mm. Subjects also received axial T2-weighted, 3D isotropic fast fluid-attenuated inversion recovery (FLAIR) and axial T2*-weighted sequences to detect significant vascular pathology or microbleeds. FBB-PET scans were obtained with a Siemens© Biograph molecular-CT machine. PET images were acquired in 20 min starting from 90 min after intravenous administration of 300 Mbq of Florbetaben(18F) radio tracer (NeuraCeq©), administered as a single slow intravenous bolus (6 s/ml) in a total volume of up to 10 ml. MRI cortical  and subcortical  parcellations were carried out with Freesurfer 5.3 (http://surfer.nmr.mgh.harvard.edu/), following the pipeline described in https://surfer.nmr.mgh.harvard.edu/fswiki/recon-all. FBB-PET were coregistered to the MRI labeled data with the FSL 5.0 software package (https://fsl.fmrib.ox.ac.uk/fsl/fslwiki) by means of MCFLIRT, it is an intra-modal motion correction tool based on optimization and registration techniques from FLIRT (FMRIB's Linear Image Registration Tool), which next was also used. These are fully automated tools implemented in FSL 5.0 for linear (affine) intra- and inter-modal brain image registration [36, 37]. Amyloid cortical SUVR was determined as the average of the standardized uptake value normalized by the uptake in the cerebellar grey matter, with this reference region being selected from the MRI cerebellum external and cortex segments. Based on previous studies , a cut-off for SUVR above or equal to 1.45 was selected as the amyloid positivity criterion. Blood samples and the APOE genotype from each participant were routinely processed in Fundació ACE as previously described [29, 39]. In brief, blood samples were obtained in the morning after an overnight fast, collected in polypropylene vials with ethylenediaminetetraacetic acid (EDTA) and immediately refrigerated. Samples were centrifuged within 24 h from extraction to collect the plasma and then aliquoted and frozen at −80 °C until assayed. Biochemical and hematologic measurements were determined in a reference laboratory according to clinical standards. For plasma amyloid testing, four determinations were made (Additional file 2). Total plasma (TP) and free plasma (FP) Aβ40 and Aβ42 levels were quantified using two specific sandwich ELISA kits, Aβtest40 and Aβtest42 (Araclon Biotech, Zaragoza, Spain), in accordance with the manufacturer’s instructions as described elsewhere . Briefly, before analysis, each plasma sample was split into two aliquots: an undiluted aliquot and another aliquot pretreated by 1:3 dilutions in a formulated sample buffer (phosphate-buffered saline (PBS) 0.5 M, 0.5% Tween-20, 1% blocking polymer) intended to break Aβ interactions with other plasma components. Thus, levels of free and total Aβ40 and Aβ42 were separately determined in undiluted and diluted plasma, respectively. The difference between TP and FP concentration corresponds to the amount of amyloid peptide bound to plasma components (BP). The Aβ42/Aβ40 ratios in each of these plasma fractions (FP42/40, TP42/40, BP42/40, FP40/TP40, and FP42/TP42) were calculated and served as the target plasma biomarkers for this study. The levels of TP and FP obtained from plasma samples were expressed as picograms (pg) of Aβ peptide per milliliter (ml) of plasma. The analyses were always performed in duplicates of the same aliquot and in a coded manner to ensure blindness of the operator. Both inter-assay and intra-assay coefficients of variation were below 5% and 8–20% for ABtest40 and ABtest42, respectively. The detection limit was 3.13 and 200 pg/ml for ABtest40 and 1.56 and 100 pg/ml for ABtest42. One sample was removed from the original FACEHBI cohort  because both ABtest determinations were outside the upper limit of quantification (> ULQ). In ABtest42, 84 of 400 (21%) determinations were also outside the quantification range, either because they were below the lower limit of quantification (< LLQ) or due to undetectable peptide levels. We assigned the minimum value of quantification (1.56 pg/ml) to these samples. We performed several correlation and regression analyses to explore the association between plasma amyloid ratios and FBB-PET brain amyloid burden. First, we conducted a linear regression analysis using FBB-PET global SUVR as the quantitative response variable in SCD subjects. FBB-PET global SUVR was log-transformed for all analyses since it was not normally distributed. The distribution of variables and Shapiro-Wilk test are given in Additional file 3 (Figure S1). We conducted an exploratory analysis with three different transformations for the plasma Aβ42/Aβ40 ratios: dichotomous (with regard to the median of the population), quartile, and logarithmic. First, we performed Pearson and Spearman correlation analyses between log-transformed FBB-PET global SUVR and the raw values of each plasma Aβ measure of interest as well as the transformed plasma Aβ ratios (Table 2 and Additional file 4: Table S2). Next, we performed a linear regression analysis using a backward-selection procedure with FBB-PET global SUVR as the quantitative dependent variable, with age, gender, education, APOE ε4 carrier status, and the best performing log-transformed plasma Aβ42/40 ratio as independent variables (Table 3 and Additional file 5: Table S3). Bonferroni correction was used to adjust for multiple comparisons. We used logistic regression to construct four different models (Table 4) to evaluate the usefulness of the covariates selected from the backward regression model for discriminating which SCD participants were FBB-PET amyloid positive (> 1.45) in 199 participants. The models were structured to reflect categories of predictive information by the ease of its acquisition. Accordingly, the first model (model #1) included only predictors that can be easily obtained (age). The second model additionally requires a blood extraction and includes two parts: model #2a for APOE ε4 carrier status (0–1) which served as the reference model for discrimination of amyloid PET-positive subjects as proposed by Petersen , and model #2b for a plasma determination of TP42/40 in log units. The third model (model #3) included the three variables described above (age, APOE, and TP42/40). Finally, the fourth model (model #4) only included the target plasma biomarker (logTP42/40). 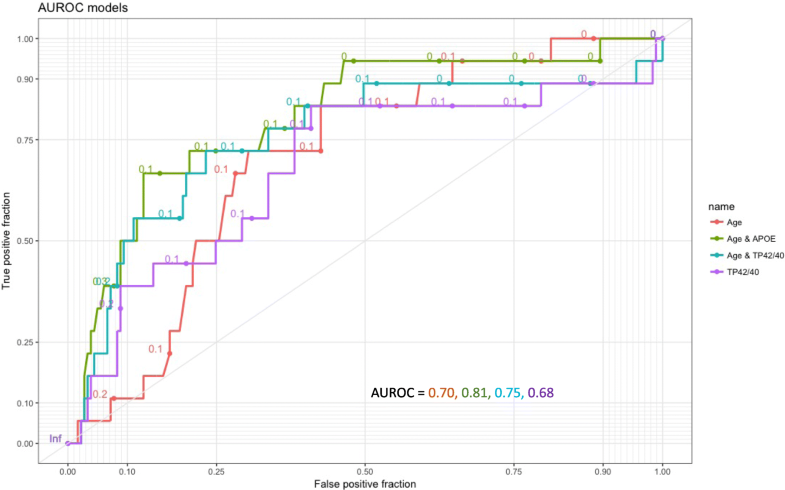 We used the area under the receiver operating characteristic curve (AUROC) from the models as a measure of how well the model discriminated between FBB-PET positive and negative subjects. The criterion for choosing the operating point along the ROC curve was Youden’s index maximum. The logistic models allowed us to assign a predicted probability of being FBB-PET SUVR positive to each subject based on values for the selected variables in the model. In addition to sensitivity/specificity performance measures, the predictive values (positive (PPV) and negative (NPV)) of the models were calculated. Finally, the effect of APOE genotype on plasma Aβ levels was assessed by comparing Aβ plasma measurements between APOE ε4 carriers and noncarriers by analysis of variance (ANOVA) (Additional file 6: Table S4) by performing separate regression analyses between logTP42/40 and FBB-PET global SUVR in APOE ε4 carriers and noncarriers (Additional file 7: Figure S4), and by testing the interaction term between APOE ε4 carrier status and logTP42/40 in the logistic regression model #3 described above. Statistical analysis was performed with SPSS 19 and RStudio Version 1.0.136. The Ggplot2 package was used for graphic representations. The FACEHBI study has been designed to identify the most important factors related to preclinical AD . To evaluate the strength of the association between plasma amyloid biomarkers and Aβ-PET burden, we conducted correlation analyses. Logarithmic TP42/40 and FP42/40 showed significant negative Pearson’s correlations with amyloid PET burden, although only TP42/40 exceeds the Bonferroni correction (r = −0.248 (−0.374 to −0.113); p = 4.04E-04). In contrast, direct plasma levels of Aβ40 and Aβ42 did not significantly correlate with FBB-PET global SUVR (Additional file 4: Table S2C). BP42/40 was excluded from further analyses due to collinearity with TP42/40 (Pearson’s r = 0.972 (0.963–0.979); p < 2.2E-16; Additional file 4: Table S2A). Backward regression analysis identified age, APOE ε4 status (0–1), and logTP42/40 as significant covariates of the best model predicting FBB-PET global SUVR (R2 = 0.193 and p value = 1.01E-09; Table 3). The inverse association between FBB-PET SUVR and TP42/40 is graphically represented with raw data in Fig. 1. The associations with the other Aβ plasma biomarkers are shown in Additional file 8 (Figure S2). After stratifying for APOE ε4, the linear regression analysis showed a negative relationship between plasma TP42/40 and FBB-PET uptake (r = −0.523 (−0.185 to −0.067); p = 8.12E-05) exclusively in APOE ε4 carriers (Additional file 9: Figure S3). 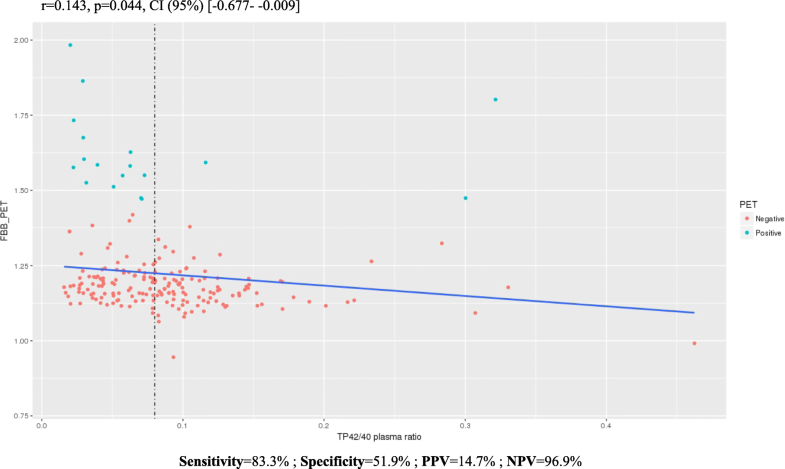 To assess the relevance of the plasma biomarkers in predicting amyloid PET positivity, the TP42/40 model was selected for the subsequent AUROC analysis. Education and gender were excluded due to their lack of significance in the backward regression model. When Aβ-PET was used as the standard classifier for Aβ+/Aβ– status, all models worked in a similar way to the reference discrimination model #2a with age and APOE as predictors (AUROCs of 0.702, 0.806, 0.754, 0.818, and 0.681 for models #1, #2a, #2b, #3, and #4 respectively; Table 4, Fig. 2). The effect and significance of TP42/40 was maintained in the different models indicating a robust association with Aβ-PET positivity. Model #2a presented the best balance between PPV/NPV (34.3–96.3%, respectively), but at the same time showed the lowest sensitivity (66.7%). On the other hand, TP42/40 alone (model #4) achieved the best sensitivity (83.3%) and a good NPV (97.2%), indicating its value as a potential screening tool for detecting brain amyloidosis (Table 4). Using an empirical cut-off point of TP42/40 = 0.08, individuals with a TP42/40 plasma ratio < 0.08 (52.8%) would be prescreened with a FBB-PET scan, capturing 83% of the positive amyloid cases, thus reducing the prescreening number of Aβ FBB-PET (sensitivity = 83.3%; specificity = 51.9%; NPV = 96.9%; PPV = 14.7%; Fig. 1). In the current study, we found no association between APOE genotype and plasma Aβ measurements, indicating independence between both variables. No plasma Aβ measure significantly differed between APOE ε4 carriers and noncarriers (Additional file 6: Table S4 and Additional file 7: Figure 4). This independence, confirmed by the absence of significance for the interaction term between APOE ε4 and logTP42/40 (Additional file 10: Table S5) (odds ratio (OR) 0.022, 95% confidence interval (CI) 2.30E-04 to 2.201); p = 0.105) could be an advantage if using this biomarker as a screening tool since it would avoid bias resulting from APOE screening. The FACEHBI study has been designed to identify the most relevant factors related to preclinical AD in a cohort of individuals with SCD . FACEHBI has a 9% prevalence of amyloid PET positivity, which is lower than similar series reported in the literature. Ossenkoppele et al. estimated a prevalence of 11% brain amyloid positivity in a cohort of healthy controls aged 55–64 years, and 22% in those aged 65–74 years. In a meta-analysis , Jansen et al. reported a prevalence of amyloid PET positivity of approximately 20% at age 65 years. The Mayo Clinic population study  showed a prevalence of amyloid PET positivity of 13% in the age group 60–64 years and 32% in those aged 65 to 69 years. A possible cause for the low prevalence of amyloid PET positivity in the FACEHBI cohort is that a strict definition of cognitive normality was used. A score of 1.5 SD below the mean according to age and level of education in any single NBACE  test precluded individuals from enrolling into the FACEHBI study. Other studies with a more liberal definition of cognitive normality included patients that would have been considered to have MCI by our standards, presumably increasing their prevalence of amyloid PET positivity. Secondly, the setting of the study is relevant, as it is well known that participants from clinical samples tend to show higher risk of cognitive progression (and probably greater brain amyloidosis) than those from population-based samples and healthy volunteers, even though both groups are considered to be cognitively normal. In this regard, FACEHBI is a mixed sample, but most of our participants (70%) are healthy volunteers from the community who came to check their cognition for free through Open Door Initiatives. This could partly explain a lower prevalence of brain amyloidosis in our FACEHBI participants compared with pure clinical samples. The main finding of this study is that lower plasma Aβ42/40 ratios (particularly the TP42/40 ratio) correlate with higher cerebral Aβ plaque burden assessed by amyloid FBB-PET imaging in the FACEHBI SCD cohort. This inverse correlation is presumably driven by the reduction of Aβ42 and the increase of Aβ40 in the Aβ+ population (Additional file 11: Figure S5). These results are independent of previous explorations and are in line with other promising results reporting similar associations between plasma Aβ42/40 ratio and cortical fibrillary Aβ burden [15, 44–50] (for review see [51–53]). This study provides added value as it is one of few [48, 49] that explores the association between Aβ plasma ratios and Aβ brain burden within a population of cognitively normal individuals, avoiding the possibility of potential circular associations related to inclusion of MCI and AD subjects along with healthy controls in the same models. Nevertheless, discrepant results from other studies [17–19, 54–56] that assessed the performance of plasma Aβ levels in predicting the Aβ brain status cannot be disregarded. Part of this controversy could be explained by the mixed distribution of individuals with and without cerebral Aβ deposition (as quantified by amyloid PET and/or by CSF analysis) among healthy controls, MCI, and demented individuals. It is believed that the clearance of brain Aβ is reduced in AD patients compared with healthy controls. This is consistent with a report by Giedraitis et al. who found a correlation between CSF and plasma levels of both Aβ40 and Aβ42 in healthy individuals, whereas no correlations were seen in AD or MCI patients. Thus, the search for an association between blood and brain Aβ levels should be directed towards the earliest stages of the disease (preclinical/prodromal AD), which is also when it is of maximum clinical interest especially as a target population for the development of novel disease-modifying therapies. However, it has been difficult to draw definite conclusions with respect to changes in plasma Aβ concentration in AD  because of the inconsistency of the available data. Stringent standardization is required to obtain reliable data that facilitate comparison between studies. In this study we used Aβ42/Aβ40 plasma ratios (particularly the TP42/40 ratio) instead of single peptide measurements to attenuate possible bias in single Aβ peptide level quantifications caused by inconsistencies in sample handling . The regression model that included only the TP42/40 ratio did not show sufficient predictive ability to identify those individuals with a positive FBB-PET scan, accounting for only 20% of the variance. Clearly, screening with these factors would not be an acceptable option for determining amyloid PET positivity in the clinical practice setting. Nevertheless, the plasma TP42/40 ratio showed a significant negative correlation with FBB-PET SUVR. This suggests that this plasma Aβ biomarker could be useful as an enrichment tool to identify potential candidates for clinical trials focused on preclinical AD. To prove this, we would need to reproduce the results in a controlled trial with an independent sample. Our analyses suggest that inclusion of the TP42/40 plasma biomarker in a classifier model could reduce unnecessary amyloid PET scans, facilitating recruitment for clinical trials. Taking this into account, in a clinical trial recruiting scenario targeting cognitively normal people, a prescreening step using a TP42/40 classifier (cut-off value = 0.08) would reduce the number of individuals undergoing Aβ FBB-PET scans to 52.8%. The cortical Aβ burden of these subjects would have to then be confirmed by Aβ FBB-PET scans. Consequently, this strategy would reduce the costs  of identifying individuals with brain amyloidosis for AD prevention trials . We observed an association of age with plasma Aβ ratios as described in previous studies [41, 42, 59, 61]. No association was found between the APOE ε4 genotype and Aβ plasma ratios, demonstrating independence between APOE ε4 genotype and this candidate plasma biomarker. The linear regression analysis stratifying for APOE ε4 showed a negative relationship between TP42/40 and FBB-PET SUVR in APOE ε4 carriers but not in noncarrier SCD individuals. At first glance, these results seem contradictory with other studies reporting a significant negative relationship between plasma Aβ and amyloid PET only in APOE ε4 noncarriers [46, 48, 62, 63]. One possible explanation could stem from the difference in cohort composition, as the previous studies included patients with MCI and AD diagnosis, while our sample is comprised only of SCD individuals. Therefore, their APOE ε4 carrier group included participants who were older and more cognitively impaired than ours, whereas their APOE ε4 noncarrier group could be more similar to our APOE ε4 carrier group in terms of demographics and cognition. Therefore, they observed a negative correlation between Aβ plasma and PET in APOE ε4 noncarriers that would be equivalent to the correlation in APOE ε4 carriers in our study. We attribute this finding to the potential enrichment of preclinical AD cases in the APOE ε4+ SCD subgroup. Specifically, our hypothesis is that the rate of genuine AD cases contained in a study population might distort the correlation between Aβ-PET and plasma amyloid measurements. We consider one of the main strengths of this study is that it includes a well-defined homogeneous population putatively positioned at a very early stage of the disease. We know that the main risk factors such as age and APOE do not follow the correlation expected in advanced stages of AD , and we have previously reported  that the APOE ε4 genotype had significant effects on the association with FBB-PET global SUVR in SCD subjects. Thus, AD does not behave linearly, and it could be that the TP42/40 ratio behaves independently from APOE when positioned to the left of the disease continuum. Our data show that refraining from strict inclusion criteria, such as APOE ε4 positivity, will be important to avoid detection bias. An important limitation of this study is the fact that the FBB-PET cut-off value for positivity is arbitrary in SCD populations. The global SUVR > 1.45 cut-off value has been calculated for dementia patients but perhaps it should be adjusted for populations with different degrees of cognitive impairment or even on different segments of the AD continuum. Another limitation is the small sample size which warrants independent replication. Although Fandos et al. reported similar results from the AIBL dataset in cognitively healthy and SCD individuals , it would be interesting to repeat the same analysis by Aβ cluster and replicate our findings in a larger population with a higher rate of amyloid PET-positive individuals to improve discrimination and accuracy of the plasma amyloid cut-off point. Future research should address whether the association between brain and plasma Aβ levels in SCD participants is able to discriminate those older adults who will experience a fast cognitive decline from those who will remain stable over time. The present data show an inverse association between plasma Aβ42/40 ratios and brain fibrillary Aβ deposition in SCD participants. Including the TP42/40 plasma ratio could help generate a more cost-effective recruitment strategy for clinical trials independent of the APOE genotype (reflecting the real diversity of the APOE genotype in preclinical AD) and reducing the associated costs of preselecting subjects using expensive imaging techniques. We would like to thank the patients and controls who participated in this project. We also want to thank the sponsors supporting the FACEHBI project (Grifols SA, Piramal AG, Laboratorios Echevarne, Araclon Biotech, and Fundació ACE). Fundació ACE collaborates with the Centro de Investigación Biomédica en Red sobre Enfermedades Neurodegenerativas (CIBERNED, Spain) and is one of the participating centers of the Dementia Genetics Spanish Consortium (DEGESCO). AR is receiving financial support from the Innovative Medicines Initiative 2 Joint Undertaking which receives support from the European Union’s Horizon 2020 research and innovation programme and EFPIA Grant No. 115975. AR’s research is also supported by grants PI13/02434 and PI16/01861, Acción Estratégica en Salud, integrated in the Spanish National R + D + I Plan and financed by ISCIII (Instituto de Salud Carlos III)-Subdirección General de Evaluación and the Fondo Europeo de Desarrollo Regional (FEDER- “Una manera de Hacer Europa”), by Fundación bancaria “La Caixa” and Grifols SA (GR@ACE project). The present work has been performed as part of the doctoral program of IdR at the Universitat de Barcelona (Barcelona, Spain). The FACEHBI study group: C. Abdelnour1, N. Aguilera1, M. Alegret1, M. Berthier2, M. Boada1, M. Buendia1, S. Bullich3, F. Campos4, P. Cañabate1, C. Cuevas1, I. de Rojas1, A. Espinosa1, A. Gailhajenet1, S. Diego1, S. Gil1, J. Giménez5, R. Gismondi,3 M. Gómez-Chiari5, M. Guitart1, I. Hernández1, M. Ibarria1, A. Lafuente,1 F. Lomeña4, M. Marquié1, E. Martín,1 J. Martínez1, A. Mauleón,1 G. Monté1, M. Moreno1, S. Moreno-Grau1, L. Núñez6, A. Orellana,1 G. Ortega1, A. Páez,6 A. Pancho,1 J. Pavía4, E. Pelejà,1 A. Pérez-Cordon,1 V. Pérez-Grijalba7, P. Pesini7, S. Preckler1, O. Rodríguez-Gómez1, J. Romero7, M. Rosende-Roca1, A. Ruiz1, S. Ruiz1, L. Montrreal1, A. Sanabria,1 M.A. Santos-Santos,1 M. Sarasa7, O. Sotolongo-Grau1, L. Tárraga1, M.A. Tejero5, M. Torres6, S. Valero1, L. Vargas1, and A. Vivas5 (1Research Center and Memory Clinic, Fundació ACE, Institut Català de Neurociències Aplicades, UIC-Barcelona, Spain; 2Cognitive Neurology and Aphasia Unit (UNCA), University of Malaga, Spain; 3Piramal Imaging GmbH, Berlin, Germany; 4Servei de Medicina Nuclear, Hospital Clínic I Provincial, Barcelona, Spain; 5Departament de Diagnóstic per la Imatge, Clínica Corachan, Barcelona, Spain; 6Grifols, Barcelona, Spain, and 7Araclon Biothech, Zaragoza, Spain). This work was funded by the sponsors supporting the FACEHBI project: Grifols SA, Piramal AG, Laboratorios Echevarne, Araclon Biotech, and Fundació ACE. AR, LT, MB, MS, and PP contributed to the study concept and design. IdR analyzed, interpreted and drafted the manuscript. AR and PP contributed to the literature search and drafted the manuscript. AR and SV contributed to analysis and interpretation of data. OR-G, AS, AP-C, CA, IH, MR-R, AM, LV, MA, AE, GO, MG, AG, MAS-S, SR, LM, EM, EP, AO, and SM-G were involved in data collection, recruitment and evaluation of the patients. JR, PP, VP-G, and MS participated in analytical data acquisition. FL, FC, AV, MG-C, MAT, and JG performed MRI and FBB-PET assessments. OS-G and GM-R analyzed the neuroimaging data. All authors read and approved the final manuscript. The FACEHBI protocol received approval from the ethics review board of the Hospital Clinic i Provincial (Barcelona, Spain) (EudraCT: 2014–000798-38). All the participants signed written informed consent prior to any evaluation according to Spanish biomedical laws and to the principles of the Declaration of Helsinki. JR, PP, VP-G, and MS are employees of Araclon Biotech Ltd. MS holds several patents related to Alzheimer’s disease diagnosis and treatment, and he is the founder, chief executive officer, chief scientific officer, and one of the current shareholders of Araclon Biotech Ltd. The remaining authors declare that they have no competing interests. Izco M, et al. Changes in the brain and plasma Abeta peptide levels with age and its relationship with cognitive impairment in the APPswe/PS1dE9 mouse model of Alzheimer’s disease. Neuroscience. 2014. https://doi.org/10.1016/j.neuroscience.2014.01.003. Ruiz A, et al. Blood amyloid beta levels in healthy, mild cognitive impairment and Alzheimer’s disease individuals: replication of diastolic blood pressure correlations and analysis of critical covariates. PLoS One. 2013. https://doi.org/10.1371/journal.pone.0081334. Lövheim H, et al. Plasma concentrations of free amyloid β cannot predict the development of Alzheimer’s disease. Alzheimers Dement. 2017. https://doi.org/10.1016/j.jalz.2016.12.004. Rodríguez-Gómez O, Abdelnour C, Jessen F, Valero S, Boada M. Influence of sampling and recruitment methods in studies of subjective cognitive decline. J Alzheimers Dis. 2015. https://doi.org/10.3233/JAD-150189. Rodriguez-Gomez O, et al. FACEHBI: a prospective study of risk factors, biomarkers and cognition in a cohort of individuals with subjective cognitive decline. Study rationale and research protocols. 2016. https://doi.org/10.14283/JPAD.2016.122. Ossenkoppele R, et al. Prevalence of amyloid PET positivity in dementia syndromes: a meta-analysis. JAMA. 2015. https://doi.org/10.1001/jama.2015.4669. Alegret M, et al. Concordance between subjective and objective memory impairment in volunteer subjects. J Alzheimer’s Dis. 2015. https://doi.org/10.3233/JAD-150594. Janelidze S, et al. Plasma β-amyloid in Alzheimer’s disease and vascular disease. Sci Rep. 2016. https://doi.org/10.1038/srep26801. Willemse E, et al. How to handle adsorption of cerebrospinal fluid amyloid-β (1–42) in laboratory practice? Identifying problematic handlings and resolving the issue by use of the Aβ42/Aβ40 ratio. Alzheimers Dement. 2017. https://doi.org/10.1016/j.jalz.2017.01.010. Moreno–Grau S, et al. Exploring APOE genotype effects on AD risk and β-amyloid burden in individuals with subjective cognitive decline: the FACEHBI study baseline results. Alzheimers Dement. 2017. https://doi.org/10.1016/j.jalz.2017.10.005.